Chorus effects can be used in a ton of different ways and have been for decades. Use it as a subtle way to widen your guitar tone or use it to create rolling warbly landscapes. It can be used on any instrument and vocals alike. Sknote has a great line of pedal plugins inspired mostly by vintage gear. 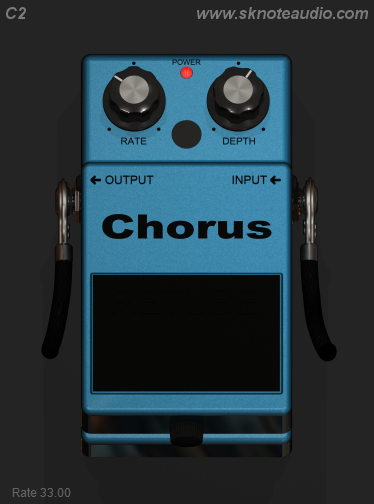 This one is based on an old Boss Chorus pedal that I assume is the CE-2. Like the other plugins in the Sknote pedal series, the C2 Chorus is made to look a little grainy and vintage. I like the look and the GUI is about as easy as easy gets. The sound is really great but in my opinion, the CE-2 isn’t the most versatile chorus. It does a variety of things well but for more involved chorus applications, I reach for something with a few more bells and whistles. That said, I am a fan of simplistic chorus pedals with just depth and rate settings. I have used the C2 for hard rock tones like Zakk Wylde, I also love it on clean tones in every way possible. Another application I am fond of is putting chorus on a buss track to infuse and widen things just a touch. It makes for a nice little mixing trick! This plugin will do anything and everything the original does. It’s a very accurate and detailed representation of one of the better choruses ever made! !